Be ready to save the day when cuts and grazes appear with our promotional Plasters range. Banged your head or accidentally sliced your finger? Not to worry, a custom printed plaster will be there to help seal up those wounds. Branded plasters always come in handy meaning whether they’re stashed way in the draw or locked up in the first aid box, they’re sure to be the first point of call when it comes to keeping dirt and grit out of the wounds. Our personalised plasters are perfect for handing out at events for insurance companies, popping into your workplace first aid kit or for hospital handouts. In search of a box of plaster to hand out at your event? 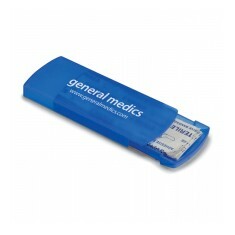 Our personalised Plaster Box comes with 5 plasters stored inside a plastic box. 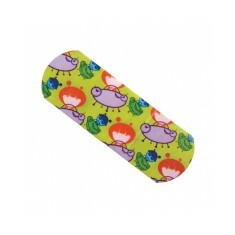 However, if you have a an awesome design, why not make your own custom Printed Plasters? Branded straight onto the outer side of the plaster, these customised plasters are CE approved and make sure that your brand is seen by everyone whenever your customer has a slip or trip. Looking for a different size? Give our sales team a call and we can find the perfect size for you. Compact plastic case. Custom printed plaster box. 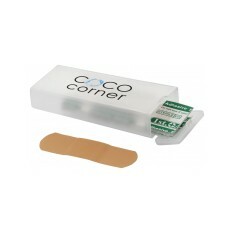 Includes 5 adhesive plasters. CE approved. Custom printed plaster personalised to outer side. Direct branding.